In approaching some of the many challenges of Wonder Dome one of the most pressing and intimidating was how to approach programming media playback for a show with a constant media presence. 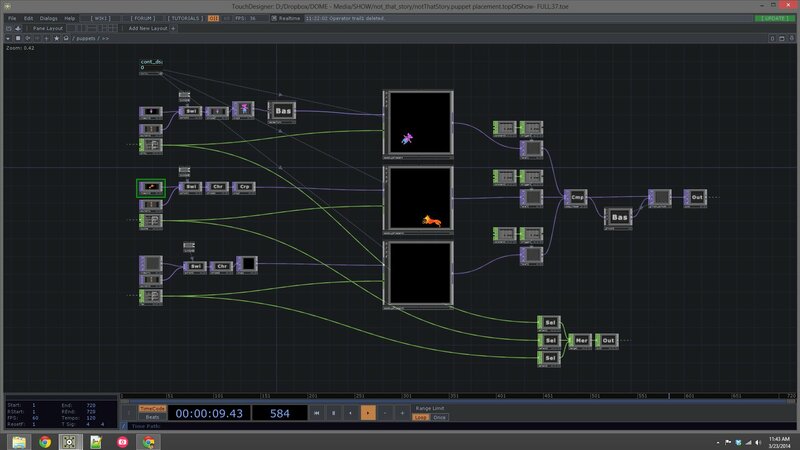 One of the challenges we had embraced as a team for this project was using Derivative’s TouchDesigner as our primary programming environment for show-control. 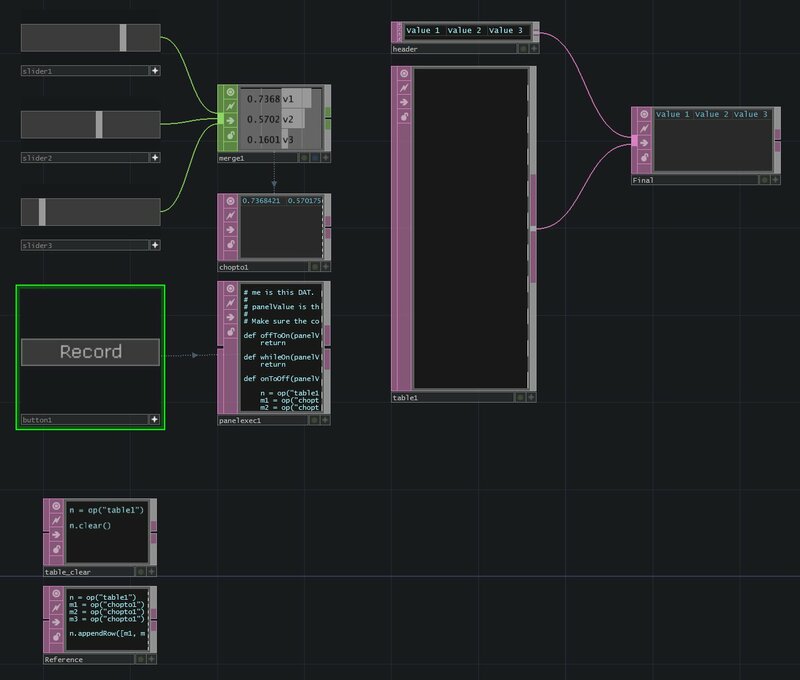 TouchDesigner, like most programming environments, has very few limitations in terms of what you can make and do, but it also requires that you know what it is that you want to make and to do. Another challenge was the fact that while our team was full of bright and talented designers, I was the person with the broadest TouchDesigner experience. One of the hard conversations that Dan and I had during a planning meeting centered around our choices of programming environments and approaches for Wonder Dome. I told Dan that I was concerned that I would end up building an interface / patch that no one else knew how to use, fix, or program. This is one of the central challenges of a media designer – how to do you make sure that you’re building something that can be used / operated by another person. I wish there were an easy answer to this question, but sadly this is one situation that doesn’t have simple answers. The solution we came to was for me to do the programming and development – start to finish. For a larger implementation I think we could have developed an approach that would have divided some of the workload, but for this project there just wasn’t enough time for me to both teach the other designers how to use / program in TouchDesigner and to do the programming needed to ensure that we could run the show. Dan pointed out in his thesis paper on this project that our timeline shook out to just 26 days from when we started building the content of the show until we opened. The question that follows, then, is – how did we do it? How did we manage to pull of this herculean feat in less than a month, what did we learn along the way, and what was an approach that, at the end of the process, gave us results that we used? Make a plan and stay organized. I really can’t emphasize this enough. Wonder Dome’s process lived and died in our organization as a team, and as individuals. One of the many hurdles that I approached was what our cuing system needed to be, and how it was going to relate to the script. With three people working on media, our cue sheet was a bit of a disaster at times. This meant that in our first days working together we weren’t always on the same page in terms of what cue corresponded to what moment in the play. We also knew that we were going to run into times when we needed to cut cues, re-arrange them, or re order them. For a 90 minute show with 20 media cues this is a hassle, but not an impossibility. Our 25 minute long kids show had, at the beginning, over 90 media cues. In beginning to think about how to face this task I needed an approach that could be flexible, and responsive – fast fast fast. The solution that I approached here was to think about using a replicator to build a large portion of the interface. 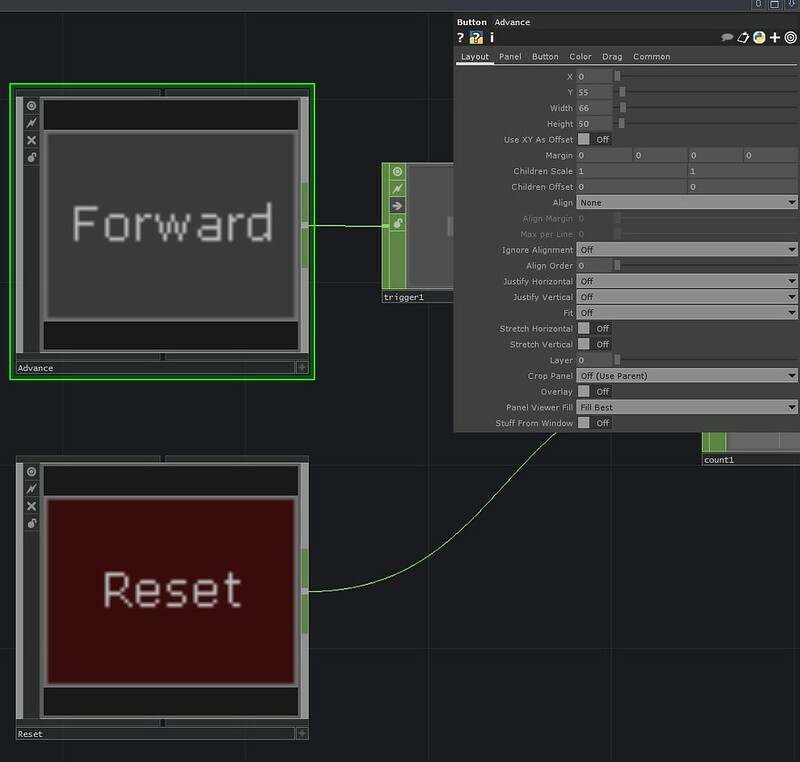 Replicators can be a little intimidating to use, but they are easily one of the most powerful tools that you can use in TouchDesigner. Here the principle is that you set up a model operator that you’d like subsequent copies to look like / behave like. 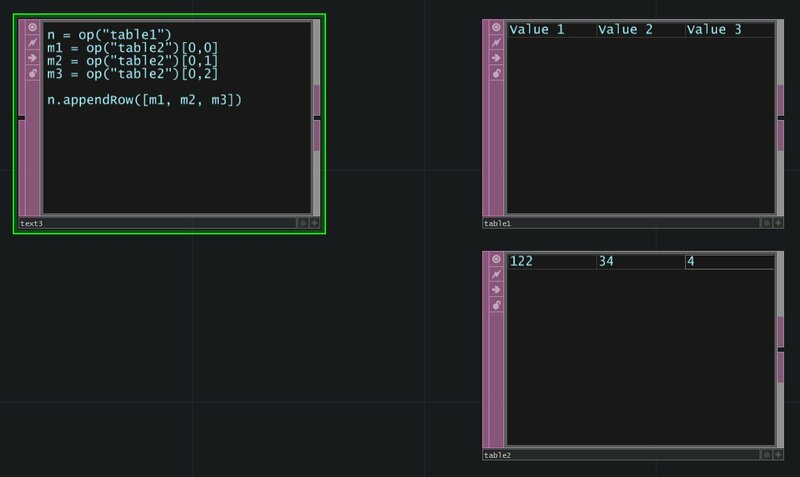 You then use a table to drive the copies that you make – one copy operator per row in the table. If you change the table, you’ve changed / remade your operators. 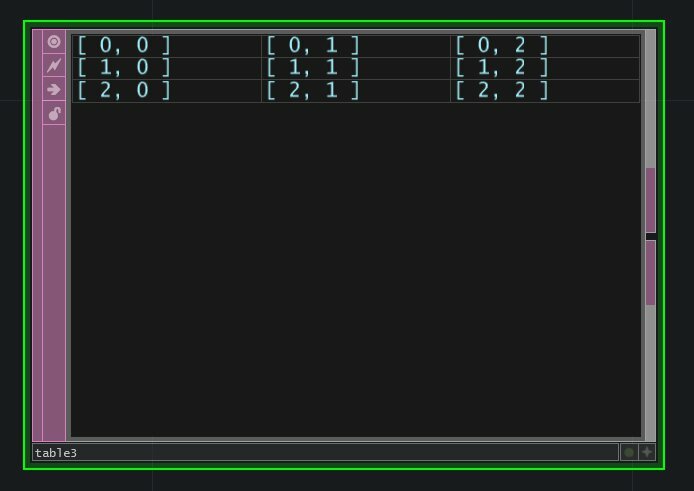 In the same way if you change your template operator – this is called your “Master Operator” – then you change all of the operators at once. For those reasons alone it’s easy to see how truly powerful this component is, but it’s also means that a change in your table might render your control panel suddenly un-usable. Cue Number – what was the number / name for the cue. Specifically this is what the stage manager was calling for over headset. This is also the same name / number for the cue that was in the media designer script. When anyone on the team was talking about M35 I wanted to make sure that we were all talking about the same thing. 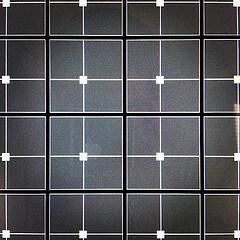 Button Type – Different cues sometimes need different kinds of buttons. 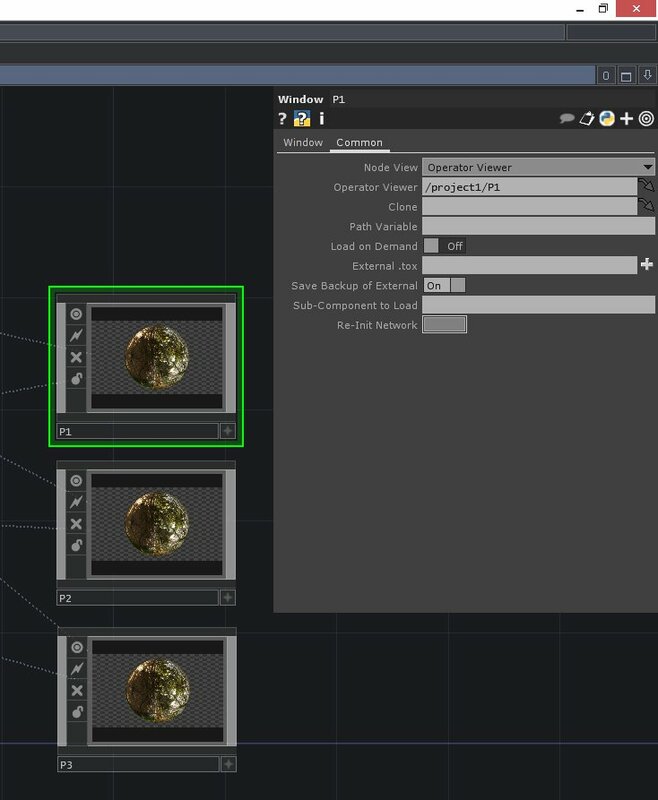 Rather than going through each button and making changes during tech, I wanted to be able to update the master cue sheet for the replicator, and for the properties specified to show up in the button. Do I want a momentary button, a toggle, a toggle down, etc. These things mattered, and by putting these details in the master table It was one less adjustment that I needed to make by hand. Puppet – Wonder Dome had several different types of cues. Two classifications came to make a huge difference for us during the tech process. Puppet entrances / exits, and puppet movements. 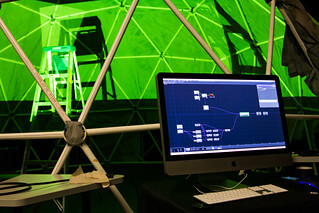 Ultimately, we started to treat puppet entrances and exits as a different classification of cue (rather than letters and numbers we just called for “Leo On” and “Leo Off”, this simplified the process of using digital puppets in a huge way for us), but we still had puppet movements that were cued in TouchDesigner. 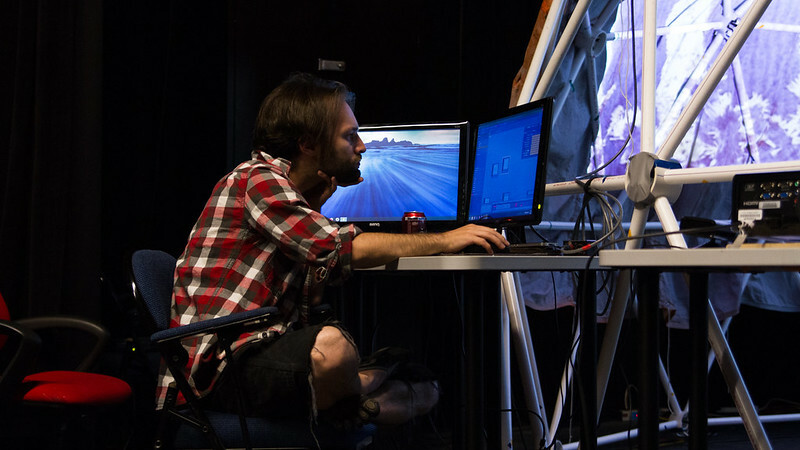 During the tech process we quickly found out that being able to differentiate between what cues were puppet movements and what cues were not was very important to us. 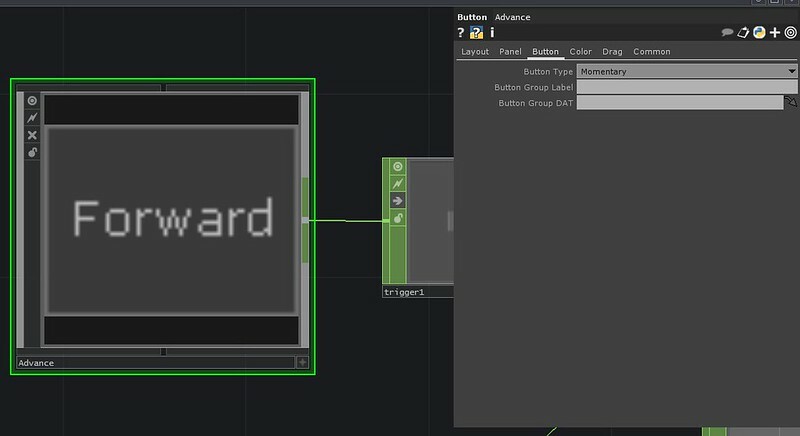 By adding this column I could make sure that these buttons were a different color – and therefore differentiated from other types of cues. Here I also took a programming precaution. I knew that invariably I was going to want to make changes to the table, but might not want those changes to be implemented immediately – like in the middle of a run for example. To solve this problem I used a simple copy script to make sure that I could copy the changed table to an active table when we were in a position to make changes to the show. By the end of the process I was probably fast enough to make changes on the fly and for them to be correctly formatted, but at the beginning of the process I wasn’t sure this was going to be the case. The last thing I wanted to do was to break the show control system, and then need 25 minutes to trouble shoot the misplacement of a 1 or 0. At the end of the day, this just made me feel better, and even if we didn’t need it in place I felt better knowing that I wasn’t going to break anything if I was thinking on my feet. Above you can see a replicator in action – looking at an example like this I think helps to communicate just how useful this approach was. Method, like organization, is just a way to ensure that you’re working in a way that’s meaningful and thoughtful. 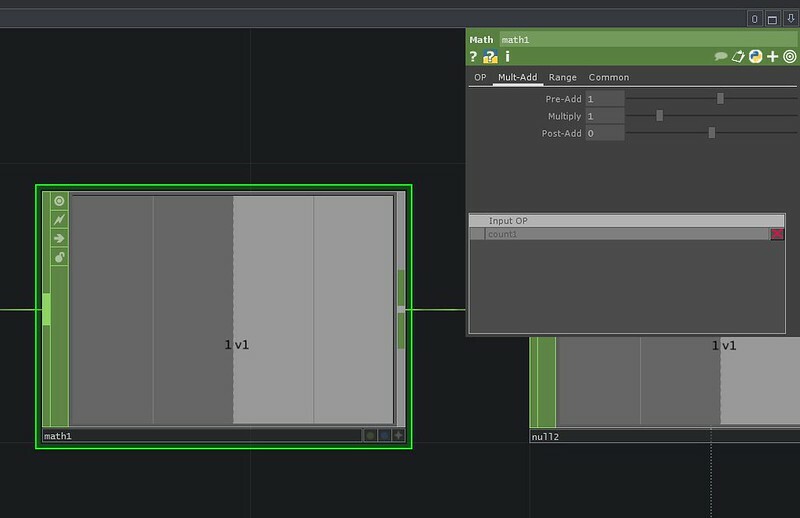 I’m sure there are other methods that would have given us the same results, or even better results, but this approach helped me find a way to think about being able to quickly implement cue sheet changes into our show control environment. It also mean that we standardized our control system. With all of the buttons based on the same Master Operator it gave the interface a clean and purposed look – staring down the barrel of a 25 show run, I wanted something that I didn’t might looking at. 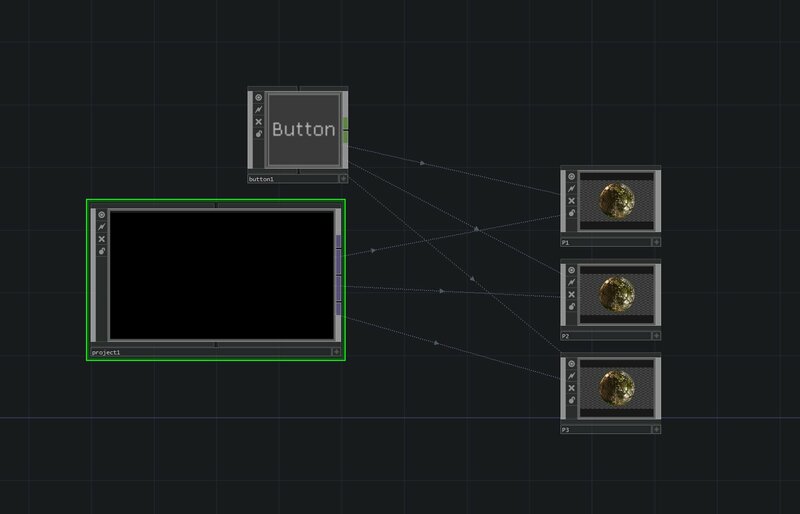 Thinking more broadly when it comes to organization, beyond just the use of replicators for making buttons I also took the approach that the show should be modular and organized as possible. This meant using base and container components to hold various parts of the show. Communication to lighting and sound each had their own module, as did our puppets. For the sake of performance I also ended up placing each of the locations in their own base as well. 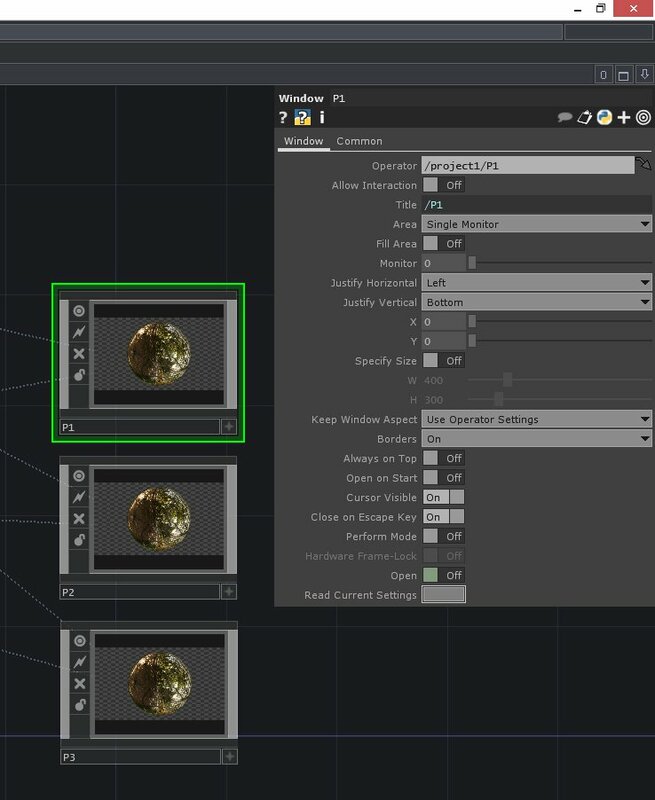 This had the added bonus of allowing for some scripting to turn cooking on and off for environments that we were using or not using at any given point in the show. We had a beast of a media server, but system resources were still important to manage to ensure smooth performance. If you want to learn more about replicators you can read through this post about getting started using them. Show control, however, is about more than just programming buttons. Driving Wonder Dome meant that we needed a few additional features at our fingertips during the show. 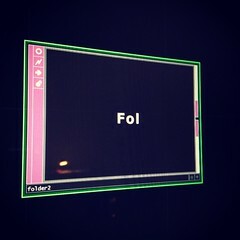 Our show control system had two preview screens – one for the whole composite, and one for puppets only. 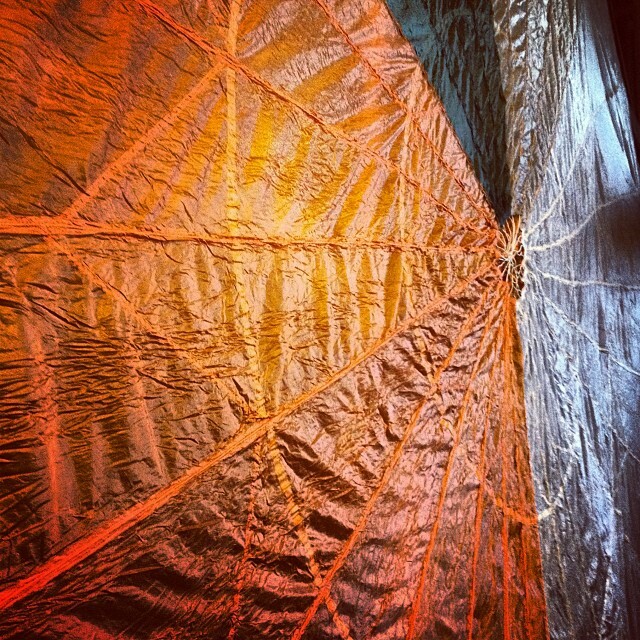 One of the interesting features of working in a dome is how limited your vision becomes. The immersive quality of the projection swallows observers, which is downright awesome. This also means that it’s difficult to see where all of the media is at any given point. This is one of the reasons that we needed a solid preview monitor – just to be able to see the whole composition in one place. We also needed to be able to see the puppets separately at times – partially to locate them in space, but also to be able to understand what they looked like before being deformed and mapped onto the curved surface of the dome. The central panel of our control system had our cues, our puppet actions, our preview monitors, and a performance monitor. 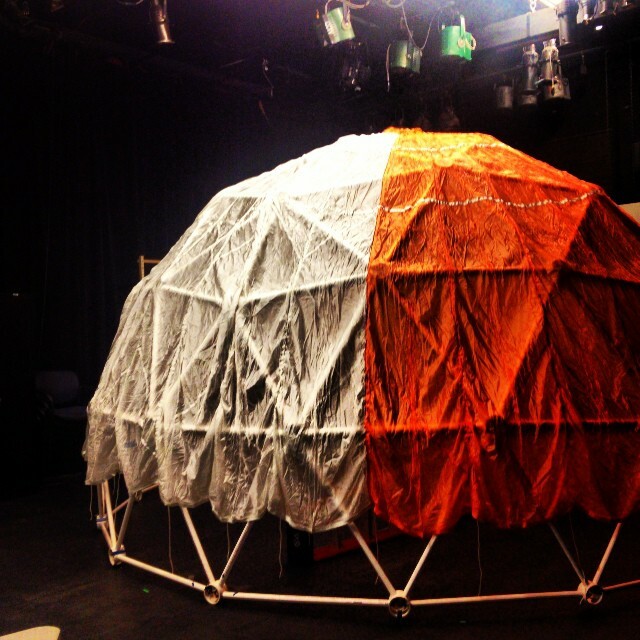 During the show there were a number of moments when we had a dome transformation that was happening while nearly simultaneously a puppet was entering or exiting. 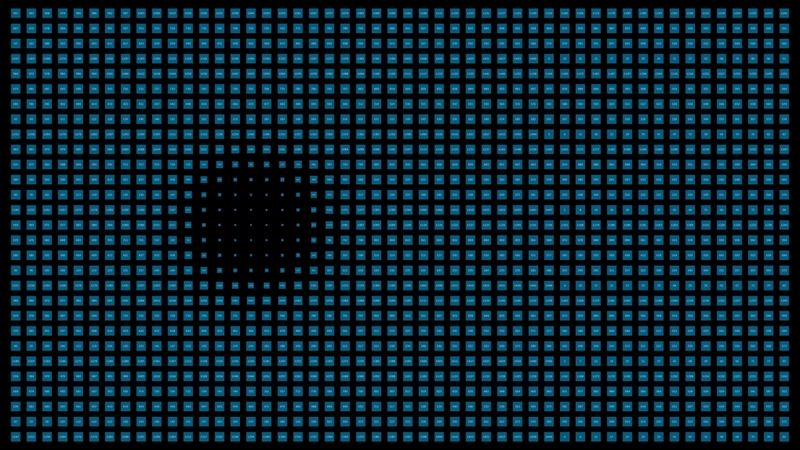 While originally I was trying to drive all of this with a single mouse, I quickly abandoned that idea. 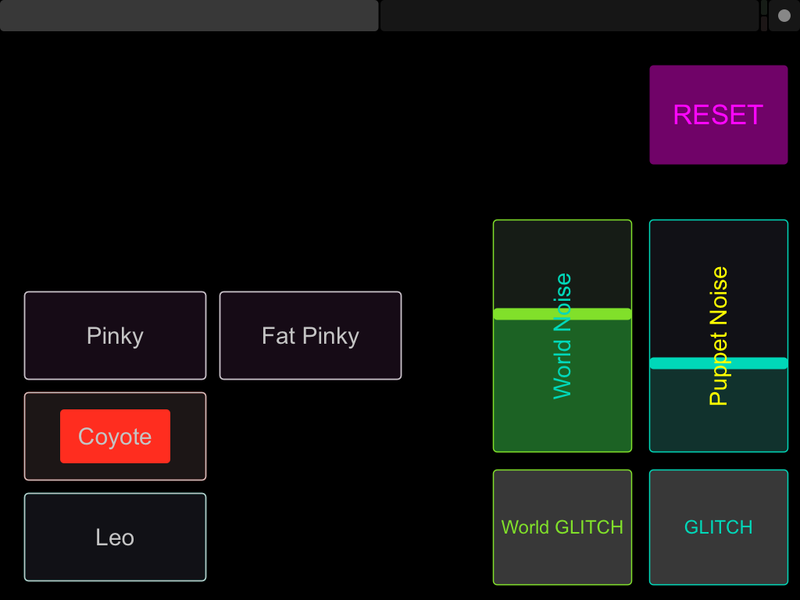 Instead I created a simple TouchOSC interface to use on an iPad with another hand. This allowed me to take a double handed approach to diving the media added some challenge, but paid itself back ten fold with a bit of practice. This additional control panel also allowed me to drive the glitch effects that were a part of the show. Finally it also made for an easy place to reset many of the parameters of various scenes. In the change over between shows many elements needed to be reset, and but assigning a button on my second interface for this task I was able to move through the restore process much faster. 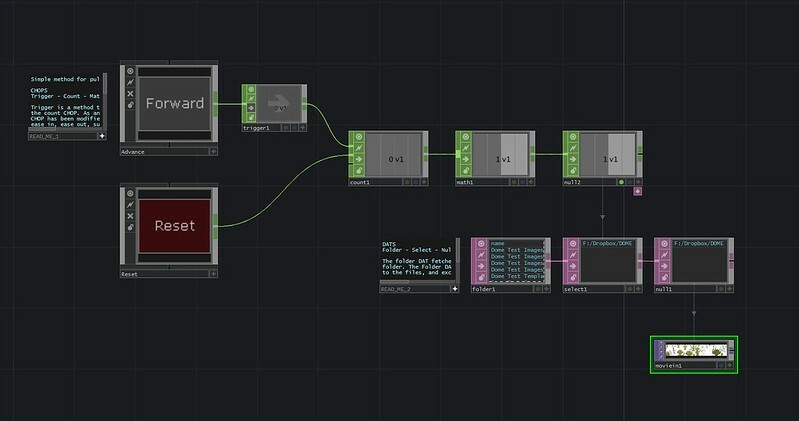 Beyond creating a system for interacting with TouchDesigner, a big question for me was how to actually think about the process of triggering changes within my network. Like so many things, this seems self evident on the face of it – this button with do that thing. But when you start to address the question of “how” then the process becomes a little more complicated. Given the unstable nature of our cue sheet, I knew that I needed a name-based approach that I called from a central location. Similar to my module based approach for building the master cue sheet, I used the same idea when building a master reference sheet. With a little push and guidance from the fabulous Mary Franck, I used an evaluate DAT to report out the state of all of the buttons from the control panel, and name them in a way that allowed for easy calling – specifically I made sure that each cue maintained it’s name letter and number convention from our cue sheet. On the face of this it seems like that’s an awful lot of scripts to write – it is, but like all things there are easier and harder ways to solve any problem. My approach to here was to let google spreadsheets do some work for me. Since cue sheet was already set-up as a spread sheet, writing some simple formulas to do the formatting for me was a quick and easy way to tackle this. 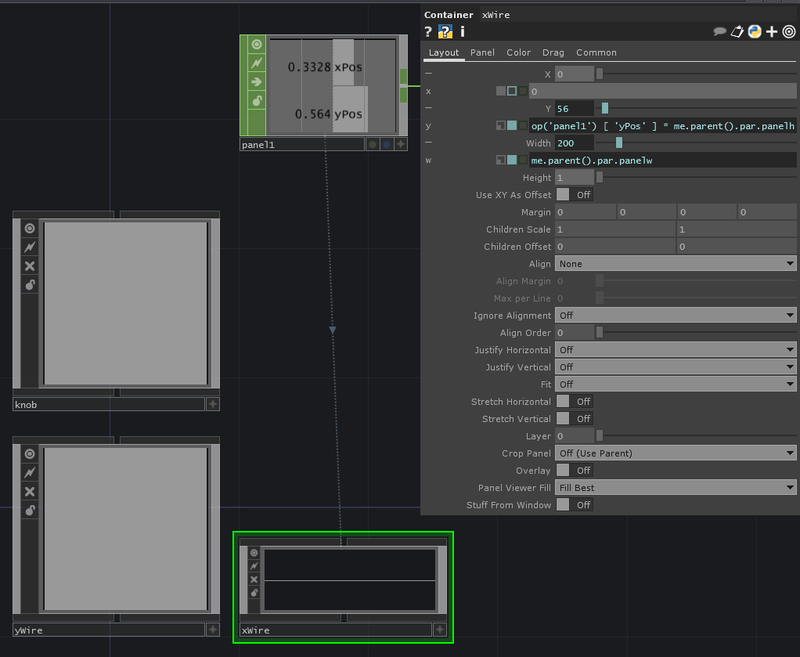 It also meant that with a little bit of planning my tables for TouchDesigner were formatted quickly and easily. 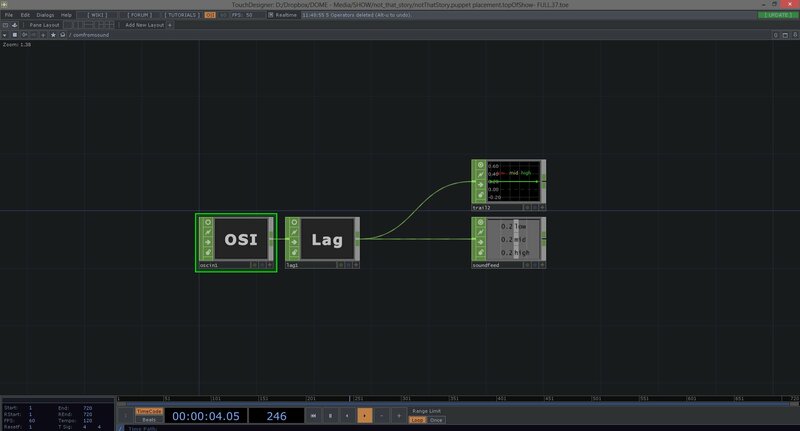 It was also here that I settled on using a series of Execute DATs to drive the cooking states of the various modules to control our playback performance. I think these DATs were some of the hardest for me to wrap my head around – partially because this involved a lot of considered monitoring of our system’s overall performance, and the decisions and stacking necessary to ensure that we were seeing smooth video as frequently as possible. While this certainly felt like a headache, by the time the show was running we rarely dropped below 28 frames per second. 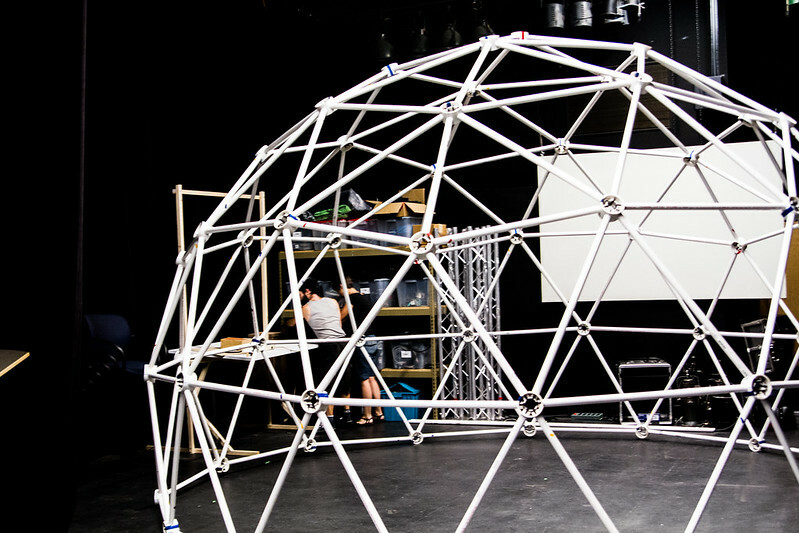 All of the designers on the Wonder Dome team had wrestled with the challenges of communication between departments when it comes to making magic happen in the theatre. To this end, Adam, Steve, and I set out from the beginning to make sure that we had a system for lights, media, and sound to all be able to talk with one another without any headache. What kind’s of data did we need to share? To create as seamless a world as possible we wanted any data that might be relevant for another department to be easily accessible. This looked like different things for each of us, but talking about it from the beginning ensured that we built networks and modules that could easily communicate. In talking with lighting, one of our thoughts was about passing information relative to the color of the environment that we found ourselves in at any given point. To achieve this I cropped the render to a representative area, then took the average of the pixel values in that area, then converted the texture data to channel data and streamed lighting the RGBA values over OSC. We also made a simple crossfader in our stream for the times when we wanted the lighting in the scene to be different from the average of the render. This technique was hardly revolutionary, but it did create very powerful transitions in the show and allowed media to drive lighting for the general washes that filled the space. This had the added benefit of offloading some programming responsibility from lighting. While I had done a lot of work in the past to coordinate with sound, I hadn’t done much work coordinating with lights. In fact, this particular solution was one that we came up with one afternoon while we were asking questions like “what if…” about various parts of the show. We knew this was possible, but we didn’t expect to solve this problem so quickly and for it to be so immediately powerful. Through the end of the run we continued to consistently get positive audience response with this technique. Part of the reason this solution was so important was be cause Adam was busy building a control system that ultimately allowed him to control two moving lights with two wacom tablets – keeping the washing lighting driven by media kept both of his hands free to operate the moving lights. The approach to working with sound was, of course, very different from working with lights. Knowing that we wanted to use spatialized sound for this show Stephen Christensen built an incredible Max patch that allowed him to place sound anywhere he wanted in the dome. Part of our conversation from the beginning was making sure that media could send location data bout puppets or assets – we wanted the voice of the puppeteers to always be able to follow the movement of the puppets across the dome. 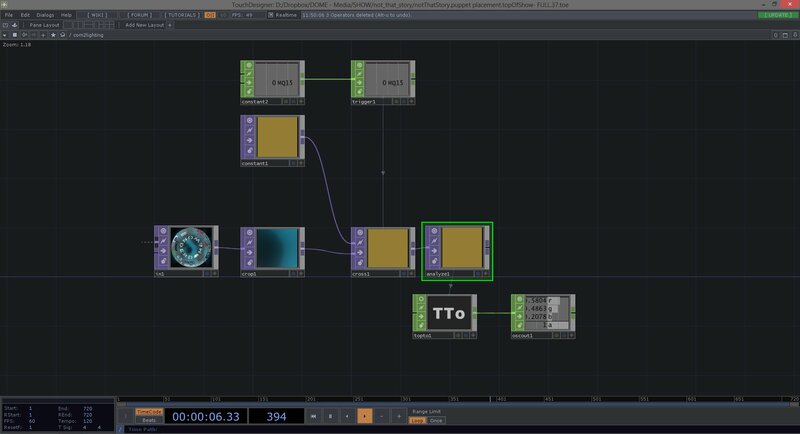 This meant that created an OSC stream for sound that carried the location of the puppets, as well as any other go or value changes for moments where sound and media needed to be paired together. Communicating with sound wasn’t just a one way street though. 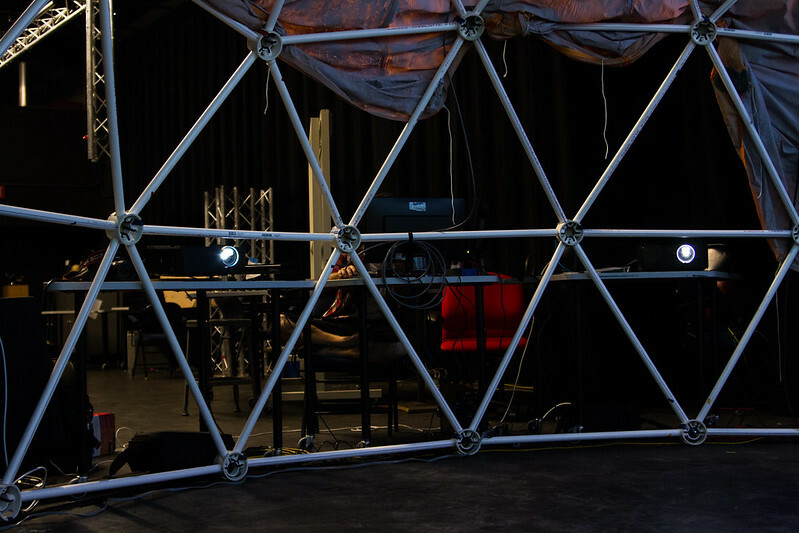 Every day the Wonder Dome had a 90 minute block of free time when festival visitors were allowed to explore the dome and interact with some of the technology outside of the framework of the show. One of the components that we built for this was a 3D environment that responded to sound, animating the color and distribution of objects based on the highs, mids, and lows from the music that was being played. 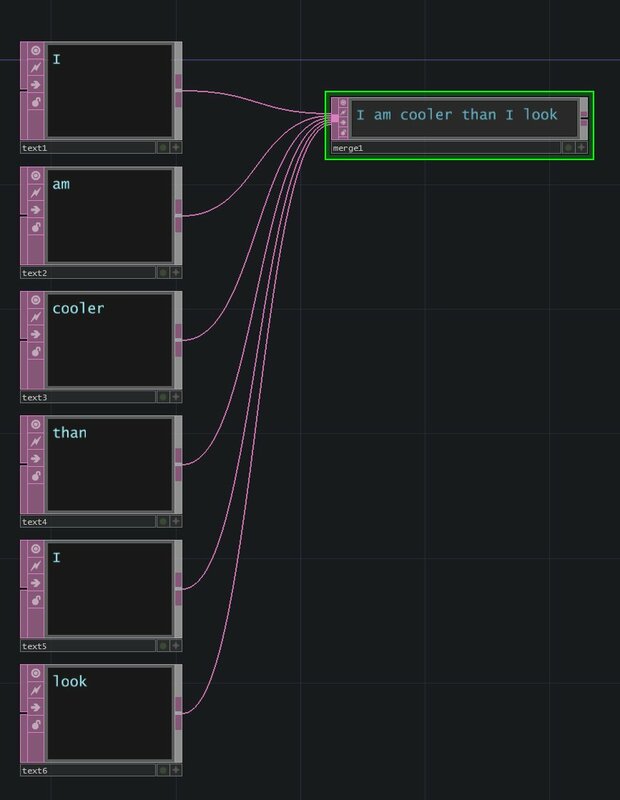 Here sound did the high, mid, low processing on its end, and then passed me a stream of OSC messages. to get a smoother feel from the data I used a Lag CHOP before using this to drive any parameters in my network. Perhaps the most important lesson to be learned from this project was the importance of developing solid reusable components. This, again, isn’t anything revolutionary but it is worth remembering whenever working on a new project. The components that you build to use and reuse can make or break your efficiency and the speed of your workflow. One example of this would be a tool that we created to make placing content on the dome. Our simple tool for moving images and video around the dome would be used time and again throughout the project, and if I hadn’t take the time early on to create something that I intended to reuse, I would have instead spent a lot of time re-inventing the wheel every time we needed to solve that problem. In addition to using this placement tool for various pieces of media in the show, this is also how we placed the puppets. During the development phase of this tool I thought we might want to be able to drive the placement of content from a iPad or another computer during tech. 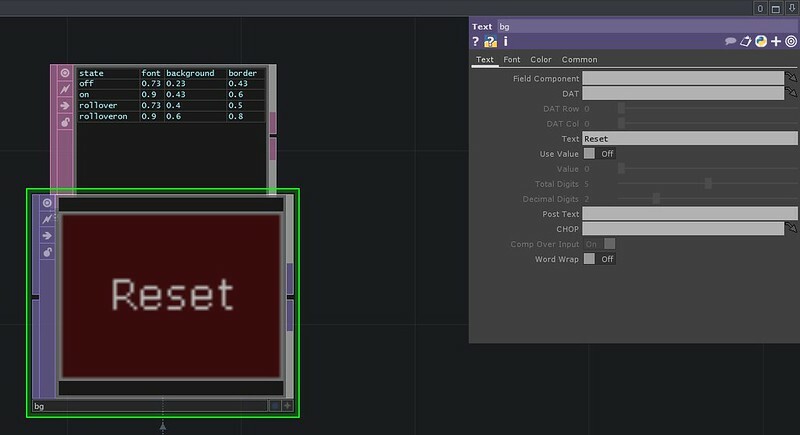 To make this easier, I made sure that there was a mechanism embedded in the tool to allow for easy control from multiple inputs. This meant that when we finally decided to adapt this tool for use with the puppets, we already had a method for changing their location during the show. There are, of course, limits to how much anyone can plan ahead on any project but I would argue that taking the time to really think about what a component needs to be do before developing it makes good sense. I also made use of local variables when working with components in order to make it easier to enable or disable various pieces of the tool. I nearly forgot to mention one of the most critical parts of this process. Documentation and commenting. If I hadn’t commented my networks I would have been lost time after time. One of the most important practices to develop and to continue is good commenting. Whenever I was working on something that I couldn’t understand immediately by just looking at it, I added a comment. I know that some programmers use the ability to insert comments with individual operators, but I haven’t had as much success with that method. Personally, I find that inserting a text DAT is the best way for me to comment. I typically write in a text editor using manual carriage returns. I also make sure that I date my comments, so if I make a change I can leave the initial comments and then append the comment with new information. I can’t say enough about the importance of commenting – especially if you’re working with another programmer. Several times during the process I would help lighting solve a problem, and good commenting helped ensure that I could communicate important details about what was happening in the network to the other programmer. I think it’s also important to consider how you document your work. This blog often functions as my method of documentation. If I learning something that I want to hold onto, or something that I think will be useful to other programmers then I write it down. It doesn’t do me any good to solve the same problem over and over again – writing down your thoughts and process help you organize your approach. There have been several times when I find shortcuts or new efficiency in a process only when I’m writing about it – the act of taking it all a apart to see how the pieces connect make you question what you did the first time and if there’s a better way. At times it can certainly feel tedious, but I’ve also been served time and again by the ability to return to what I’ve written down. This entry was posted in Design, How-To, Live Performance, media design, Programming, Software, TouchDesigner and tagged Arizona, Arizona State University, ASU, Derivative, Grad School, Live Performance, media design, programming, TouchDesigner, TouchDesigner Tutorial, Wonder Dome on April 9, 2014 by raganmd. 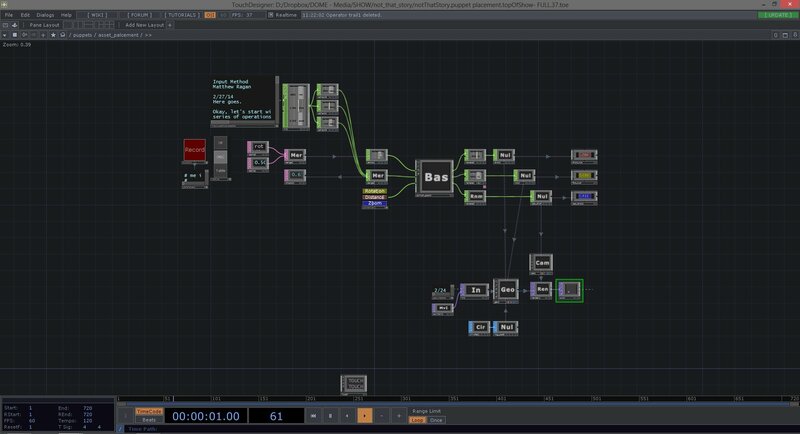 If you’re new to TouchDesigner, it’s easy to feel like DATs are a hard nut to crack. This is especially true if you’re also new to programming in general. Scripting can be daunting as you’re getting started, but it’s also incredibly important – take it from someone who is still learning, dat by dat. So what’s the big deal about DATs anyway? Better yet, why should you care? DATs can help in all sorts of ways, but lets look at a concrete example of how they can help solve some interesting problems that you might face if you’re out to save some information to use later. As the Wonder Dome team has been busy building interfaces, programming methods, and performance tools we’ve hit countless situations where being able to save some data for later use is absolutely necessary. Our lighting designer, Adam Vachon, wants to be able to mix color live during a rehearsal and then record that mix to in a cue later. Better yet, he might want to create a cue sheet with all of that data saved in a single table so he can quickly recall it during tech. Over in media, we want to be able to place video content in lots of difference places across the dome and with varying degrees of visual effects applied and we also want to be able to record that data for later recall. DATs, are a wonderful solution for this particular problem. 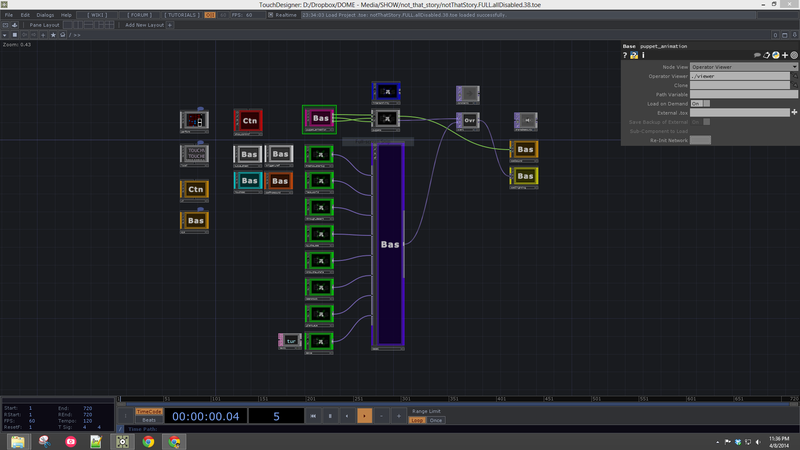 With a few DATs, and some simple scripts we can hold onto the position of our sliders to use later. Let’s take a look at how we can make that happen. First let’s look at a simple problem. I want to be able to add the values from one table to the bottom of another table. If you’re new to programming, this process is called appending. We can see an example of this if we look at two different tables that we want to add together. Now, to run our script we’re just going to right click on text3, and select “Run Script” from the contextual menu. Great! Now we’ve successfully appended one table with data from the first row of another table. If you’re still with me, now we can start to make the real magic happen. Once we understand how a script like this works, we can put it to work to do some interesting tasks for us. Let’s look at a simple example where we have three sliders, that we want to be able to save the data from. 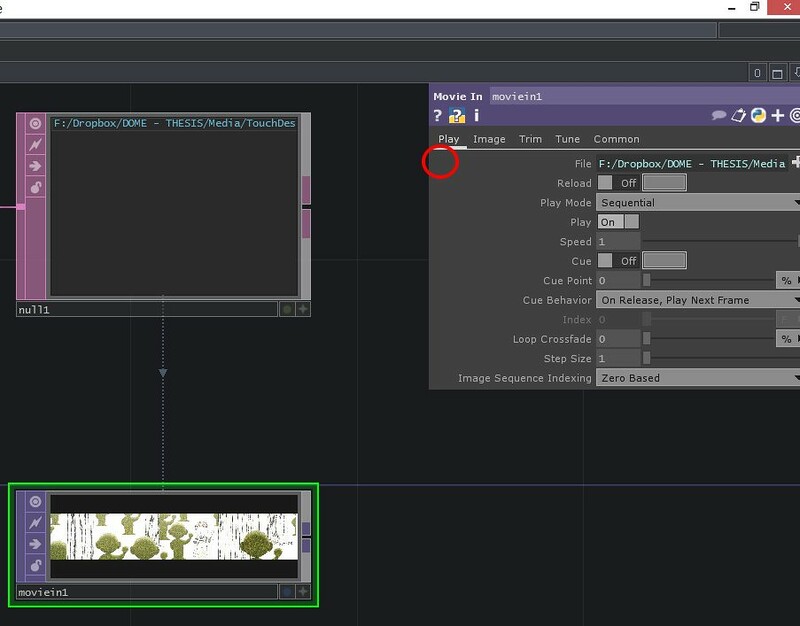 To get started, let’s make three slider COMPs, and connect them to a merge CHOP. Now lets add a Chop to DAT, and export the merge to the Chop to. 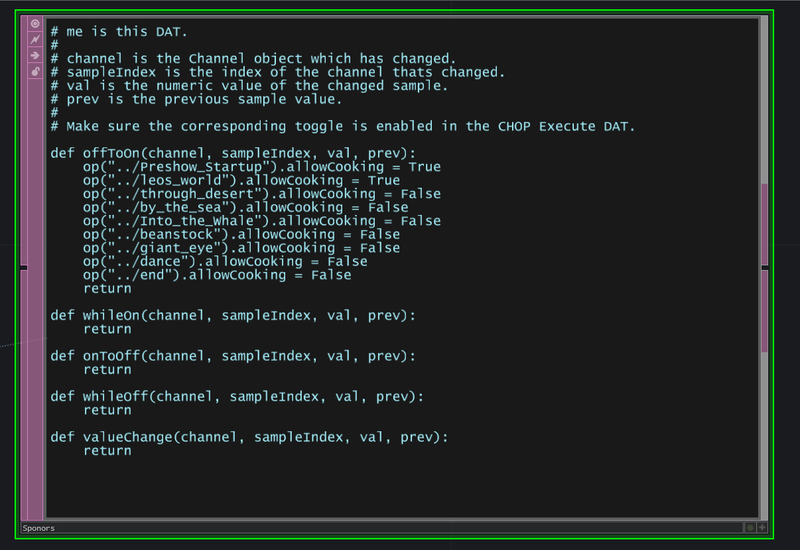 The chopto DAT is a special kind of operator that allows us to see CHOP data in DAT format. This coverts our CHOP into a table of three floats. At this point you can probably guess where we’re headed – we’re going to use our simple script that we just wrote to append the contents of our chopto to another table. Before we get there, we still need to get a few more ducks in a row. Next let’s create a table with one row and three columns. Name these columns anything you want, in my case I’m going to call them (rather generically) Value 1, Value 2, and Value 3. 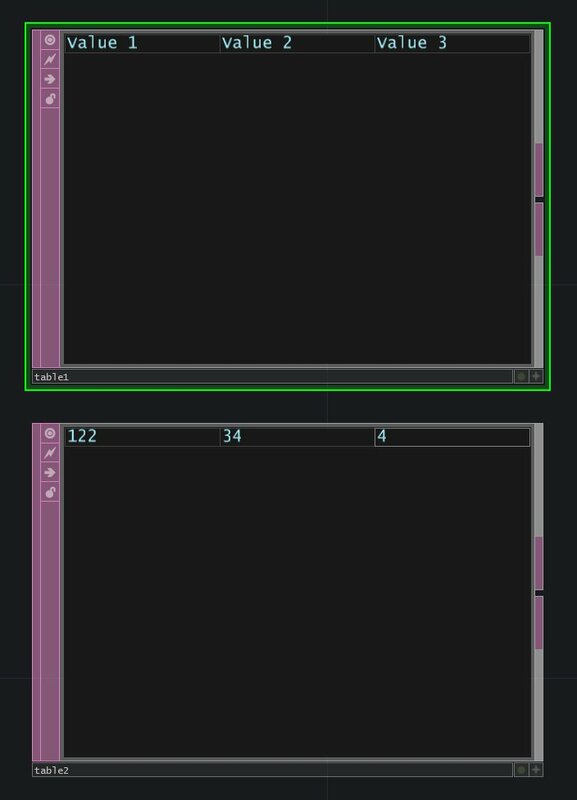 I’m also going to create a big empty table, and finally I’m going to connect both of these with a merge DAT. Why two tables? I want my first table to hold my header information for the final table. This way I can clear the whole table of saved floats without also deleting the first row of my final table. As a quick reminder, the names of your DATs is going to be very important when we start to write our script. 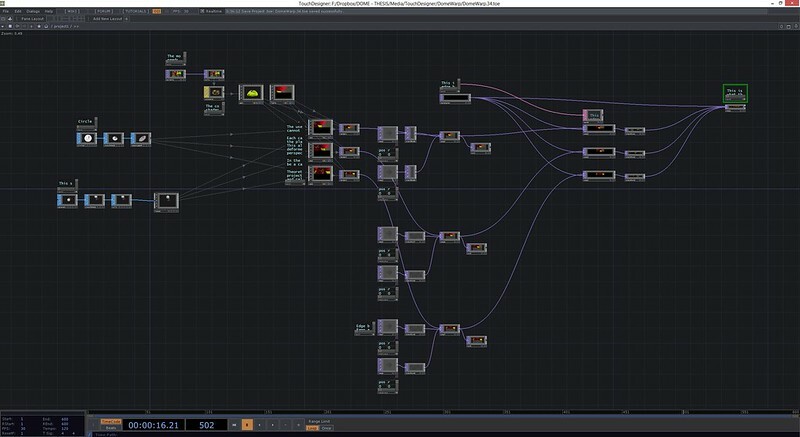 The names of our DATs is how we can identify them, and consequently how we can point TouchDesigner to the data that we want to use. 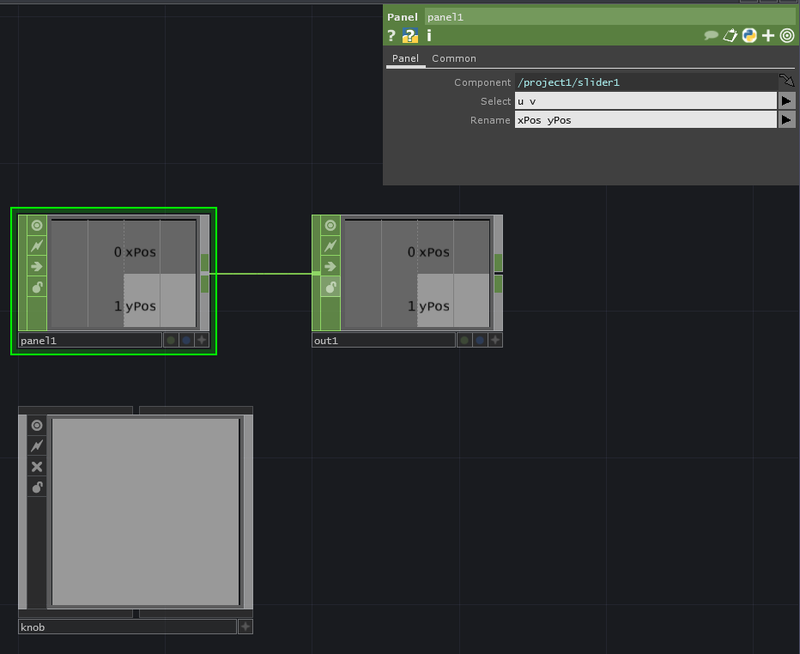 Next I’m going to add a button COMP to my network, and a panel execute DAT. In the panel execute DAT I’m going to make sure that it’s looking at the operator button1 and watching for the panel value select. 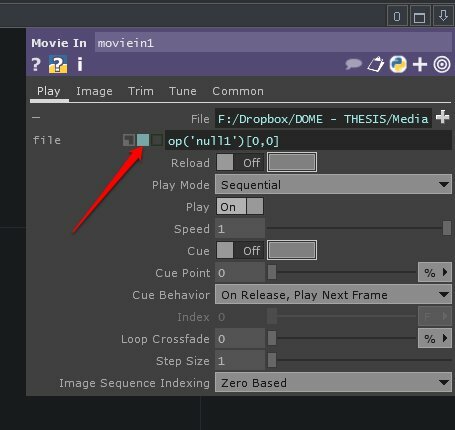 I’m also going to make sure that the On to Off box is checked – this tells the DAT when to run the script. Next I’m going to slightly alter the script we wrote earlier to right for our tables here. I’m also going to make sure that the script is in the right place in the DAT. 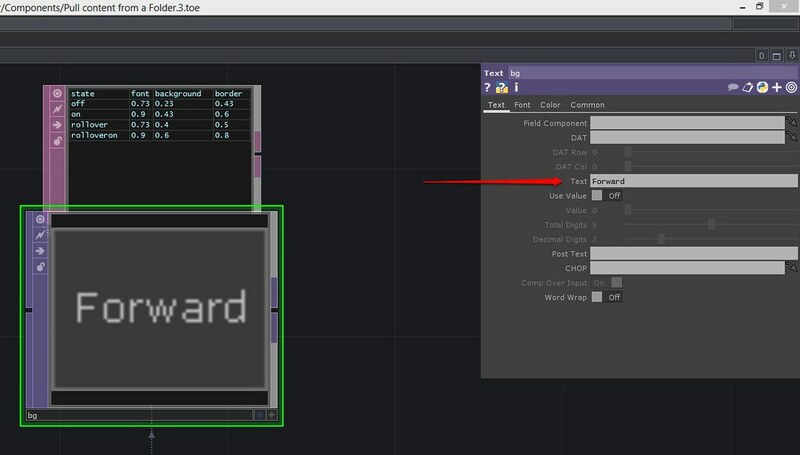 Take a closer look at the example below to see how to format your DAT. Alright, now it’s time for DAT table magic. 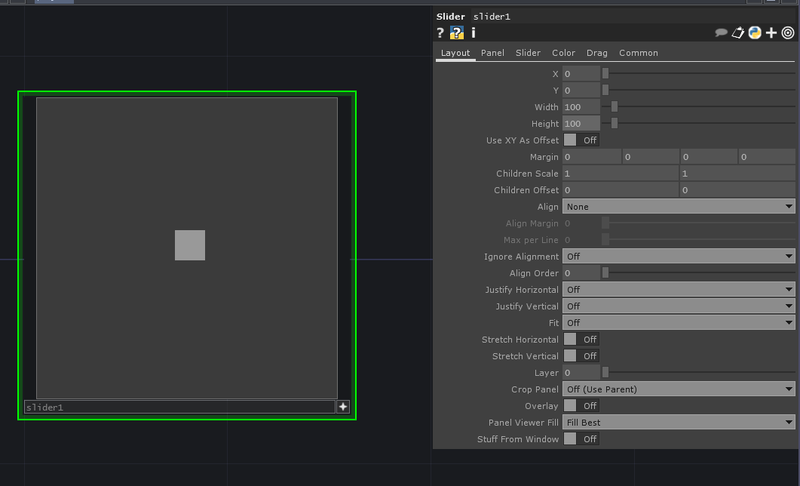 At this point you can make your sliders and button viewer active, and you’re ready to make changes and then record slider states. Happy appending. In case you still have questions you can take a closer look at my example here – record_method_example. This entry was posted in Design, How-To, Live Performance, media design, Programming, TouchDesigner and tagged Arizona, Arizona State University, Grad School, graduate school, media design, programming, TouchDesigner, TouchDesigner Tutorial, Wonder Dome on March 5, 2014 by raganmd. One of the handy building blocks to have in your arsenal as you’re working with any media system is an understanding of how it works with system folders. 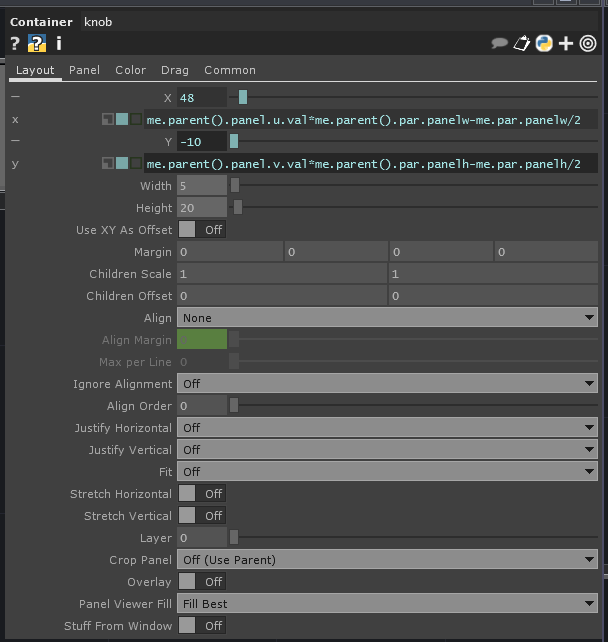 Isadora, for example, pulls assets from the folder specified when you load the original file. 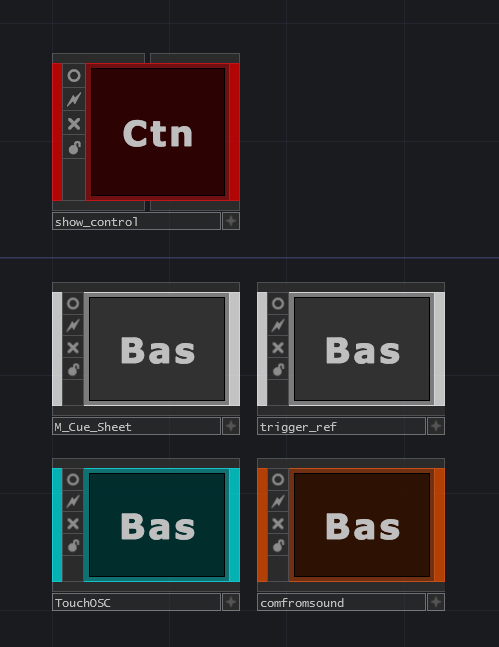 This means that you can change an asset, save it with the same name and in placing it in the proper system folder your changes show up without having to re-import any files. What then, if I want to automatically pull files from a folder on my computer? 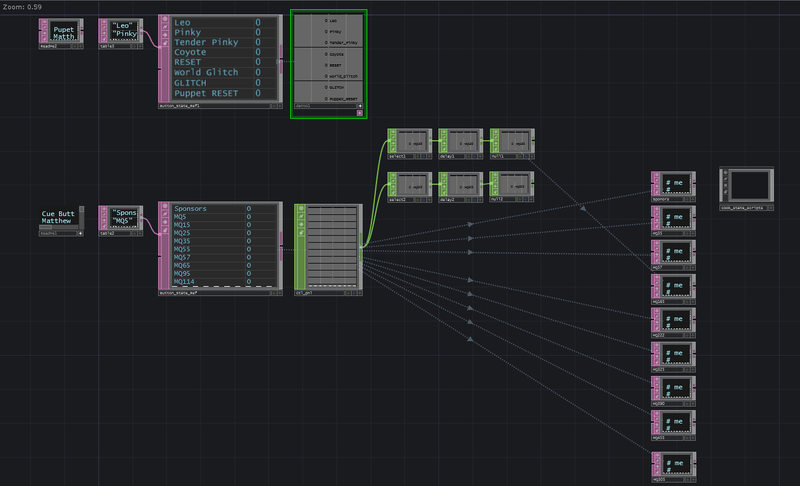 In TouchDesigner that’s a relatively simple thing to accomplish without too much work. Better yet, the underlying principles open up a lot of much more interesting possibilities. 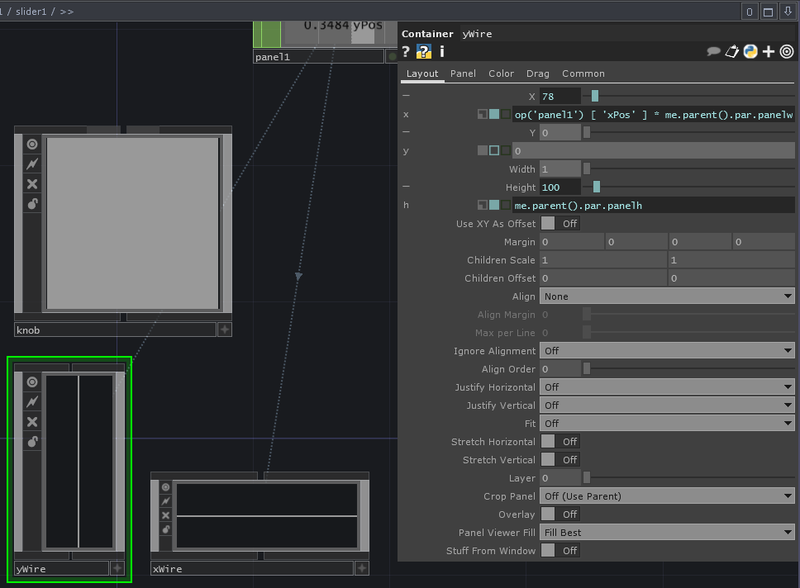 Alright, let’s start with a simple problem that we can solve with TouchDesigner. 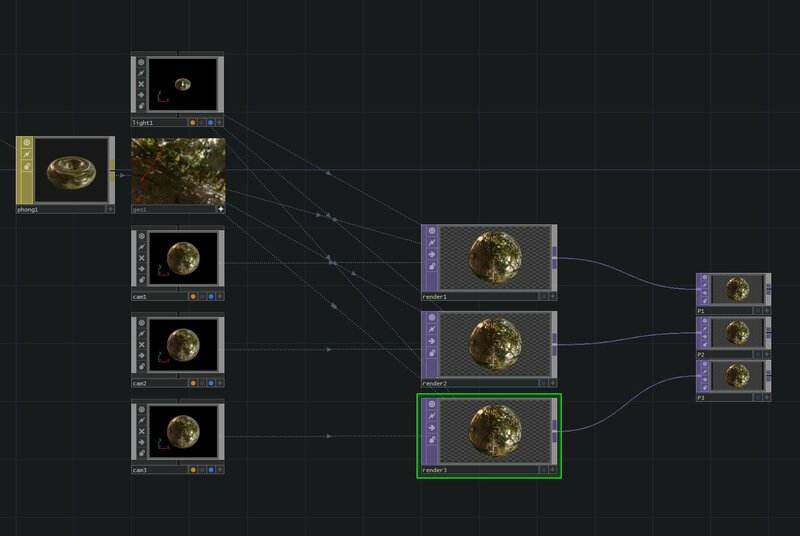 I want to build a simple patch where I can use two control panel buttons to navigate through a list of images (or movies) in a specified folder – essentially I want to be able to add my photos or videos to a folder on my computer, and then display them in TouchDesigner without having to drag them into the network or having to add a Movie-In TOP. Let’s start by looking at the full network. Our system is made of three strings – a series of CHOPs, a series of DATs, and a TOP. We’re going to use two buttons to control a series of channel operators to give us a number. We’re going to use this number to select a specific file from a folder, and then we’re going to use that file name in a Movie-In Texture Operator to be displayed. Let’s start with our CHOP string. First things first, the important place to start in this particular string is actually in the middle at the Count CHOP. The Count CHOP, in this case, is going to watch for a change in a signal and use that as a mechanism for determining when to increment or reset. 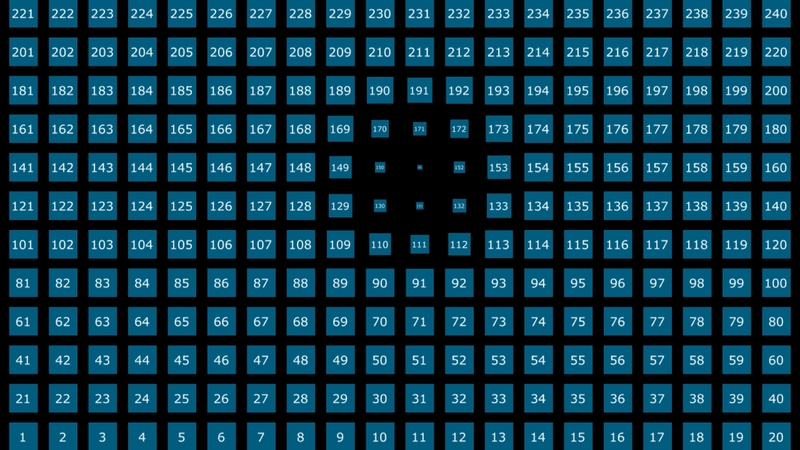 There are lots of different ways to count, but in this particular case the Count CHOP is an excellent method for incrementing from a button press. Alright, so if we know that we’re going to start with a count, then we don’t actually need the Trigger CHOP – especially as I’m going to watch a Button for a signal change. That said, the Trigger CHOP might be handy if I’m watching something that doesn’t have a specific binary, or a signal where I want a certain threshold to act as the trigger. You’ll notice that my Trigger is bypassed, but I’ve left it in my network just in case I want to use a different kind of triggering method. Alright, with some of those things in mind, lets move back to the beginning of this string. First off I start by adding to Button COMPs to my network (If you want to learn more about Buttons and Control Panels Start here). Zooming into the button COMP I can set the text for the button itself. First I want to find the Text TOP labeled “bg.” Then I want to open the parameter window for this TOP and change the Text to “Forward” (you can name this whatever you want, I just wanted to know that this button was going to move me forward through my set of photos). We’ll do the same thing for the other button, and in my case I both changed it’s name and it’s color. You can do both from the Text TOP in your second Button COMP. Moving back out of the Button COMP I’m going to make a few other changes to my buttons. I want to change their position on the control panel, and I want to make them a little larger to accommodate the longer words inside of them. 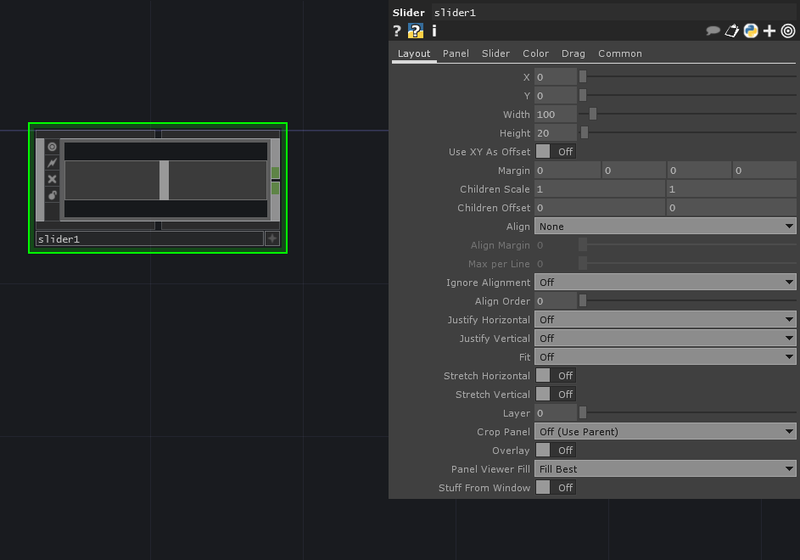 To do this I’m going to open up the parameter window of the Button COMPs and change the width of both to 66. I’m also going to change the Y location of button labeled “Forward” to 55 to make sure that my buttons aren’t on top of one another. Next I’m going to connect my Button called “forward” to the top inlet on my Count CHOP, and the Button “reset” to the middle inlet on the Count CHOP. This means that every time I click the forward button I’ll increment the count up by 1, and when I click reset it will set the counter back to 0. In my Math CHOP the only change that I’m going to make is to Pre-Add 1 to the integer coming form my count. 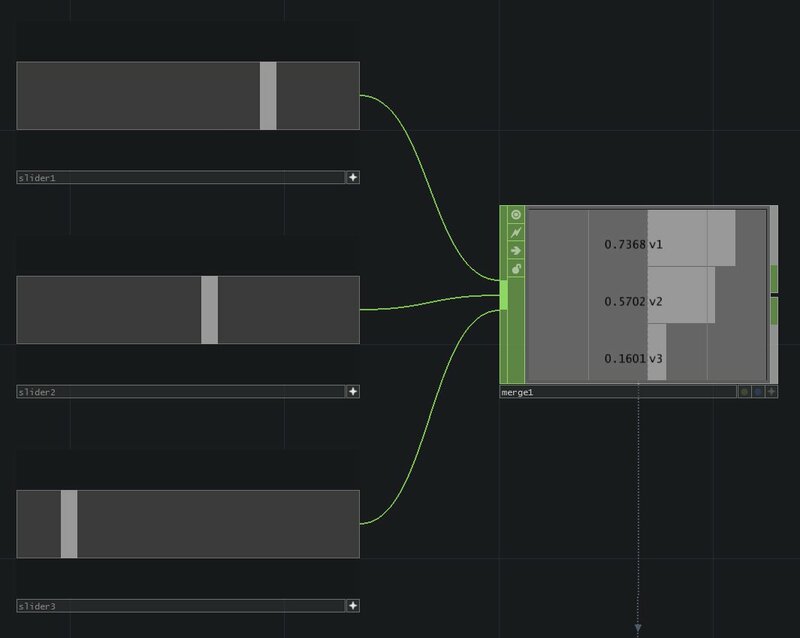 I’m going to do this because TouchDesigner counts the first row of a table as 0. When we get to our DATs we’ll see that the 0 line in our table is actually the header of a table. 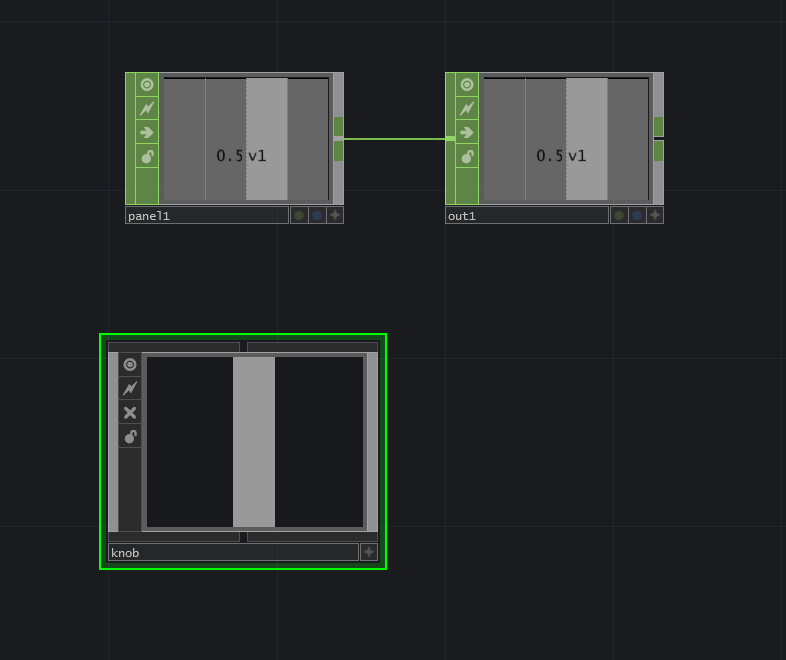 While I could tell TouchDesigner not to show the header, that doesn’t feel like the best solution – especially as I want to be able to see what columns are referring to. Last but not least, I’m going to end this string of CHOPs in a Null. 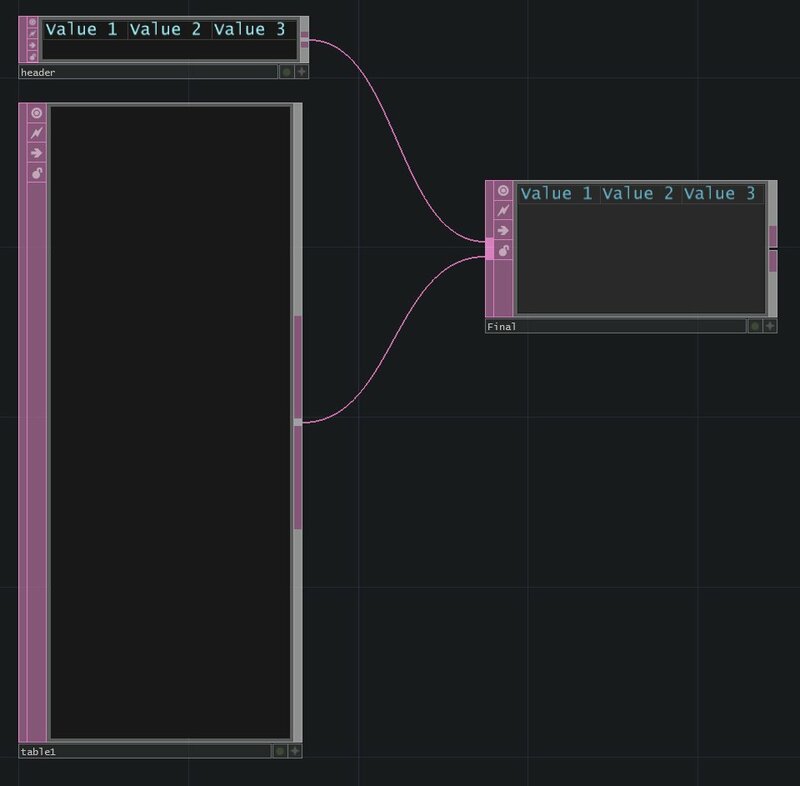 If you’re new to TouchDesigner, it’s important to know that ending a string in a Null can be a true life safer. Ending in a Null allows you to make changes up stream of the Null, without any headache. Let’s imagine in a complicated network that you’ve connected 20 or 50 different operators to a CHOP. You decide that you want to change something in your string, and you delete the final CHOP (the one that’s connected to everything) leaving you to reconnect all of those patch chords in order to get your network back up and running again. 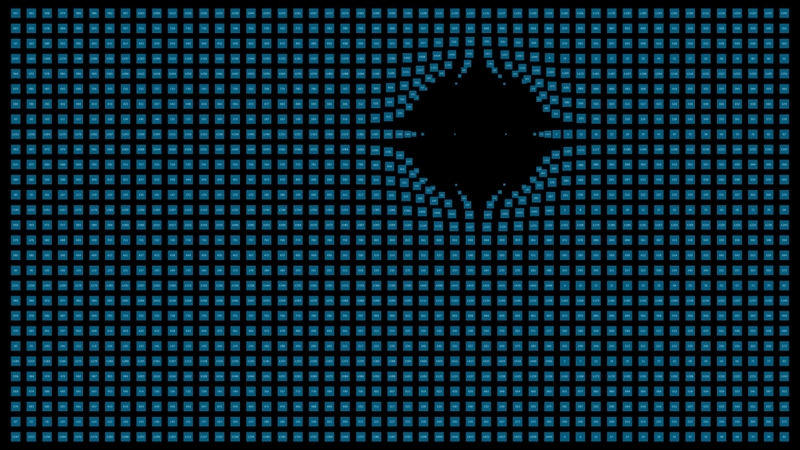 The better solution is to end the string in a Null, and then connect the Null to those 20 or 50 or 1000 other operators. Changing things up stream of the Null is easy, especially as you don’t have to reconnect all of your patch chords again. Now let’s take a look at our DAT stream. Here the Text DAT isn’t an essential part of my network, at least in terms of operation. As a general rule of thumb, I try to add comments to my networks as I’m working in them in order to make sure that I can remember how I did something. I highly recommend having some kind of commenting system, especially as this can prove to be a helpful tool to communicate with collaborators about what you’re doing with a specific part of a network. All of that to say, that we can ignore my first Text DAT. The Folder DAT will pull the contents of a specified system folder. Ultimately, I’ll need the pathway of the files in this folder. I can set the Folder DAT to give me all of that information, and specify if I want it to include the content of sub folders, or the names of sub folders. In my case I only want the names and locations of the files in this single folder. Next I want to select a single line out of this whole table. To do this, we’re going to connect the Folder DAT to a Select DAT. First up I want to set this DAT to extract Rows by Index. I want to make sure that both Include First Row, and Include First Column is turned off. 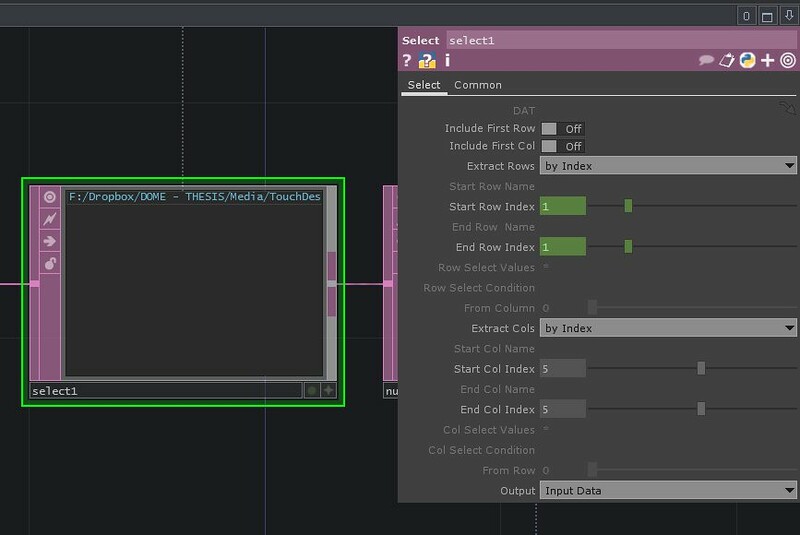 Next I want to export the Null CHOP to both the Start Row Index and the End Row Index. Finally, I want to set the Start Column Index to 5, and the End Column Index to 5 – I’m telling the Select DAT that I’m only interested in the sixth column in this table (but you set it to 5, whats the deal? remember 0 counts as a column, so when you’re counting columns in your table 0 is the new 1). I’m also telling it that I only want to see the row that’s specified by the CHOP string. Last but not least, I’m going to pass this to a Null. Finally, let’s add a Movie-In TOP to our network. Now, in the Movie-In parameter dialog we’re going to do a little typing. We need to tell the Movie-in TOP that it should reference a cell in a table in a DAT. Easy. Right? Sure it is. We’re going to first click the little plus that shows up as your pointer hovers over the left side of the parameter window. Next we’re going to toggle the field from a constant into a expression by clicking on the little blue box. If we were writing that in English it would read – Look at the Operator named “null1” and find the contents of the cell in the 0 column position and in the 0 row position. It’s important to note that the name in single quotes should be the name of the DAT Null that we created before, otherwise this won’t act as expected. There you have it. We’ve now made a network that will allow us to load the contents of a folder, sequentially based on how we use two buttons in our control panel. 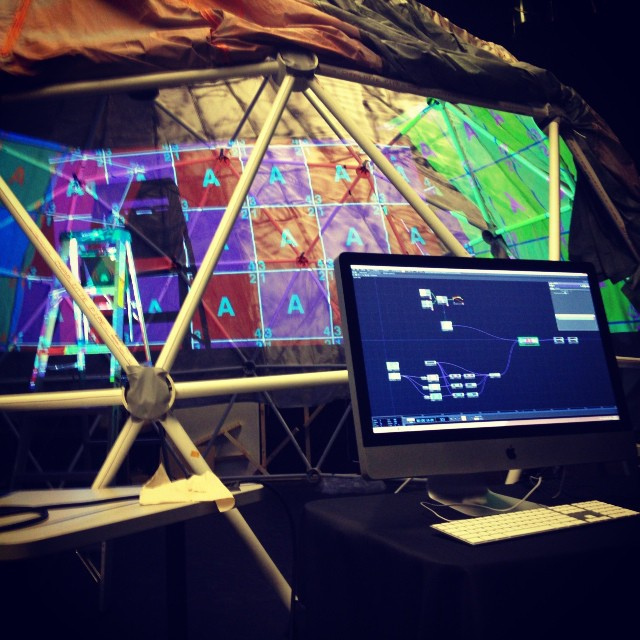 This entry was posted in Design, How-To, media design, Programming, Software, TouchDesigner and tagged Arizona, Arizona State University, ASU, Grad School, graduate school, media design, TouchDesigner, TouchDesigner Tutorial on November 10, 2013 by raganmd.